The Seattle Genealogical Society (SGS) 2019 Spring Seminar is Saturday and Sunday, May 18-19, 2019 at the Fairview Christian Church in the Maple Leaf neighborhood just south of Northgate, 844 NE 78th St, Seattle 98115. 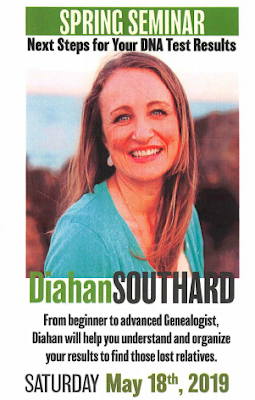 “Next Steps for Your DNA Test Results” features Diahan Southard. 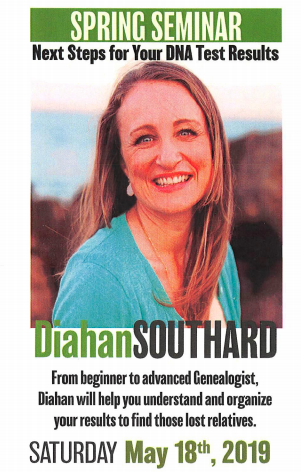 From beginner to advanced genealogist, Diahan will help you understand and help you organize your results to find those lost relatives. Also look for the Special Workshops on Sunday morning, May 19: “Organizing Your DNA Results”. Download the brochure HERE and register online HERE.